Do you have an event or party you’d like the Headless Horseman to attend? A unique experience with the added creep factor is just the thing to make your party or event stand out from the rest. The Horseman and his mighty steed are available to ride lopping off heads of friends and foes alike! 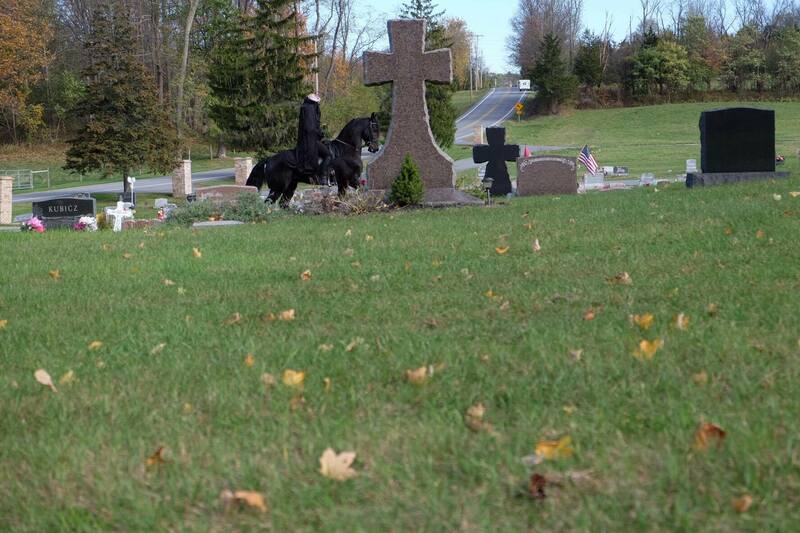 The Village of Warwick will be terrorized by the Headless Horseman tonight! Warwick’s annual Halloween Parade starts at 5:00 pm routing from Main Street to Railroad Street. The Horseman will be menacing the crowds of parade goers and the village streets throughout the evening. Spook Fest at the Stable! Halloween at CEC! Beware of the Headless Horseman! 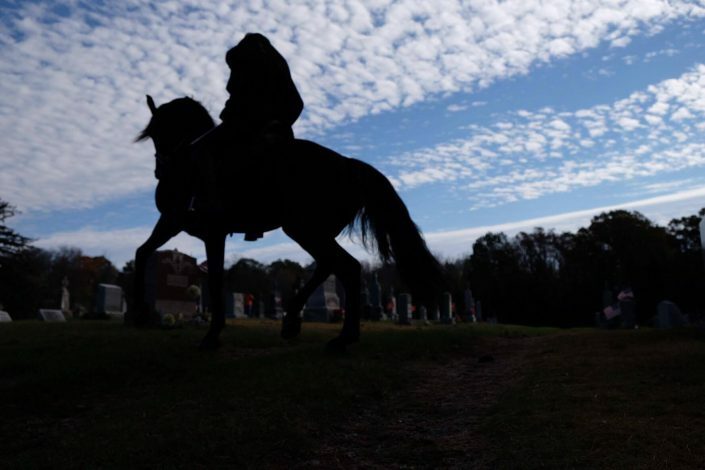 It was a spooky time at Corinthian Equestrian Center on Friday for boarders, students, and their families. CEC’s first Halloween Party was a great shindig with good eats, games, and costumes. All of the costumes were handmade by the CEC’s students and everyone looked fabulous while having loads of fun. The horses got to bob for apples, while the adults enjoyed the food and facilities. Games of Pass The Hot Gourd and Musical Stalls were a big hit. When the darkness descended the kids were playing Manhunt in and around the stable while the adults enjoyed the conversation and drinks in the lounge. CEC’s first annual Halloween Party was a scary success! Check out the Event Gallery for more images! The Headless Horsman (aka owner Lee Dillon) and Eagle will be terrorizing the Village of Warwick downtown this Friday, October 27th from 5:00 to 7:00 pm, then they’re off to the Haunted House near the Warwick Inn to scare the kids. Hunter Pace at Windy Hollow Hunt! Hunter Pace at Windy Hollow Hunt, April 23, 2017. Team Corinthian had a fabulous time participating in the Hunter Pace at the Windy Hollow Hunt on Sunday, April 23rd! A Hunter Pace is a low-key cross-country riding competition evolved from Fox Hunting. The Hunter Pace simulates the Fox Hunt with a set course throughout the countryside and participants have the opportunity to enjoy open fields and woodlands, often on private properties, throughout the day. Corinthian’s Hunter Pace Team of Kelly Hamling riding Corinthian’s Wildcard (Carder), Julia Roy MacDonald riding Corinthian’s Crimson Hunt (Handsome), and Lee Dillon riding Corinthian’s Armani took first place in the Novice Division. The next Windy Hollow Hunt, Hunter Pace is scheduled for Sunday, May 14th to start at Corinthian’s Jessup Road Farm. More information about the Pace can be found at Windy Hollow Hunt. The next upcoming event is the Garden State Preview Horse Show, April 29th to 30th at the Sussex County Fairgrounds in Augusta, New Jersey. Ken Okken, Corinthian’s resident Hunter and Jumper Trainer is the assistant manager for the show and has designed all of the courses. Lee Dillon, CEC’s owner will be riding Handsome in the hunter division on Saturday and Armani in the jumper division on Sunday. Come spend the weekend at the show! Corinthian Equestrian Center CEC, LLC is pleased to announce two days of Open House! Open to the public on Tuesday, December 27th and Thursday, December 29th from 2:00 to 6:00 pm. Come and meet Pro Trainer, Ken Okken and Owner/Trainer, Lee Dillon. It’s sure to be two lovely days to enjoy the outdoors meeting our current horsey residents with tours of the facilities. Keep warm and have a chat and a drink in the lounge with other horse enthusiasts. Located at 39 Foley Road, Warwick, NY.